Where Jung is sharpening his sweet tongue, perhaps preparing himself for Sul. A quick fix was added to the bookmark for some users who had squish problems. Please warn me if the squish problem persists (and for those who modified the "ordered loading" option, could you try without it? thanks). I think what Jung does I'd genuine but the actions he takes can be perseverance as manipulative. For example, I believe he does want to make Sang Chul get put in his place in front of everyone because he's a big jerk and always pushing other people to do his work for him while using a sob story for himself so he can get a free ride on everything but Jung won't do it himself since he has always shown he doesn't mind when Sang Chul does that to him too up until now so he is helping the next person who needs to stand up to Sang Chul the most, which is Jae Woo. Anyway I forgot to add that what he told Jae Woo to do is a good piece of advice. Wouldn't we all tell someone we know who gets pushed around too much to try and stand up for his or her self? That's exactly what Jung did but somehow it comes off as him being manipulative to others perspectives since they see him o be that type of person. Thanks again Oddsquad team! You'll never know how grateful I am. Gaaah you guys are the best! Totally xD I guess he's plan B. THANK YOU SO MUUCCCHHHH LOVE YOU GUYS!! KEEP GOING!! THANK YOU SO MUCH. I LOVE YOU!!!! I cant entered comic.naver.com :'''( i already use desktop and mobile.. chrome and firefox but it always "Problem Load Page". 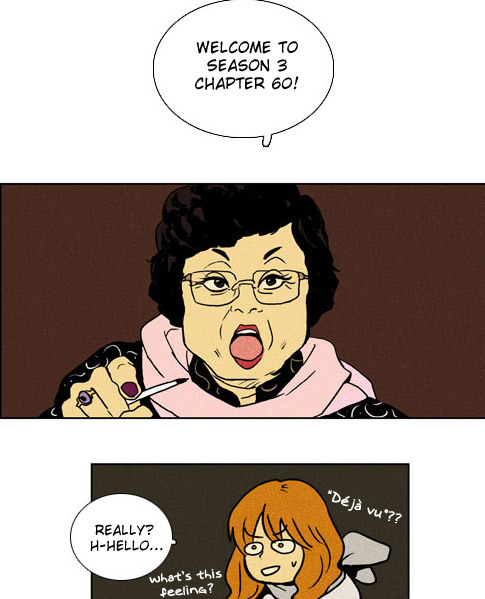 please information for season 2 chapter 39 if it can be opened in comic naver ? thank you!! can't wait for the next chapter!! Thank god you guys finally got it working. I totally missed out on when you finally managed that! Nonetheless, I"m glad I finally checked up. Thank you so much for sharing. Thank you really much for your hard work! argh I think something's wrong with me. Is it weird that I want to be as manipulating as Jung..? I can't view the webtoon at safari so I just downloaded chrome. I finished all the chapters and I'm currently waiting for Episode 61! Thank you Odd Squad for your time and effort in translating and overtooning this one of a kind story! Download overtooning. Go to wpisode you want to watch the click overtooning on the top bar. Theres a video of step by step instructions on the site if you need help. Thank you very much for your hardwork, I can read citt again, the overtooning still bother but still you guys did awesome job!!! I haven't read this webtoon for a while so I had a lot to read today. The new change with the overtooning caused me some trouble and it took me some time to figure it out, but later it worked very smoothly. You guys always do an amazing job doing overlays and translations! Anyone know if the translations have stopped since it has been a while since the last update? I don't know know where else to get translations past episode 60 this season. :c anyone know? There is nothing after chapter 60 season 3. Are you guys going to update? Wow! I put CITT on a wait list for a while because of the bookmark change. Thank you so much for the new chapters. I'm such a big fan of Oddsquad. Please always know that you have so many fans that appreciate your work. Please keep on scanlating this series I am so excited for the upcoming chapters. How do you do this on Macboook?